David Mitchell is to release a second volume of his newspaper columns in time for Christmas. 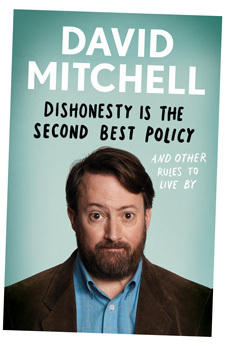 Dishonesty is the Second-Best Policy: And Other Rules To Live will be released on November 7 by Guardian Faber. The new book is a collection of his Observer columns and follows his 2015 collection Thinking About It Only Makes It Worse. Mitchell said: ‘I’m delighted to be working with the team at Guardian Faber on another attempt to set the world to rights after the last one failed so spectacularly. ‘So I’m going to really double down on the out-of-touch hypocritical centrist whingeing, while sprinkling in a few offensive jokes for old times' sake. ‘If you buy one book this autumn… then this whole industry is completely unsustainable." Mitchell also wrote his memoirs, Back Story, in 2013.